Description: This perennial wildflower typically consists of a cluster of unbranched erect stems about 3-9″ tall. These stems are terete, white (sometimes tinted pink), translucent, fleshy, and hairless. The alternate leaves are scale-like and small; like the stems, they are white, translucent, and hairless. Each stem terminates in a single white flower about ½–¾” long that is nodding to nearly erect; this flower is narrowly bell-shaped, consisting of 2-4 sepals and 4-5 petals. The petals are longer and more persistent than the sepals. Within the interior of the flower, there are 10-12 stamens surrounding a stout style. The time of year when flowers are produced can be highly variable, extending from late spring into the fall. However, the blooming period for individual plants lasts only 1-2 weeks. The flowers produce no obvious floral scent. After the blooming period, the entire plant becomes dark brown or black, and each flower is replaced by an erect ovoid seed capsule about ½” long. This seed capsule is 5-celled and contains numerous tiny seeds, which are easily blown about by the wind after the capsule splits open. The root system consists of a mat of brittle fleshy roots. 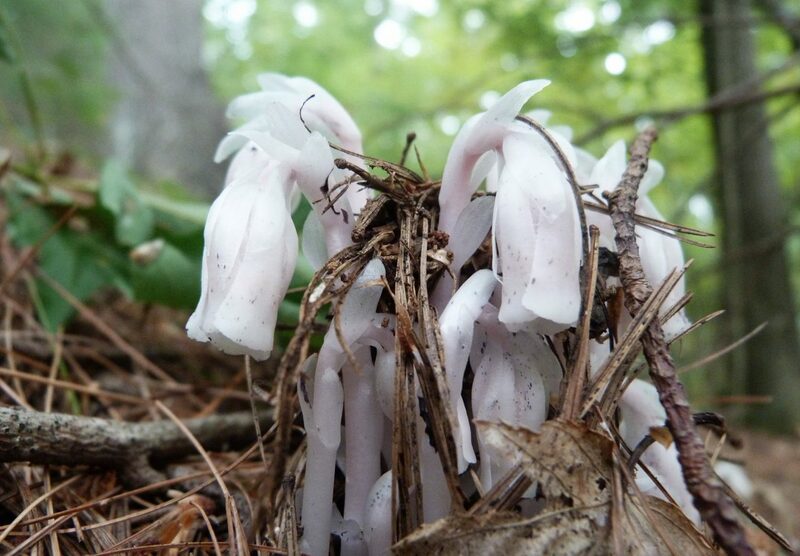 This wildflower is saprophytic and lacks chlorophyll in its tissues; it forms either a symbiotic or parasitic association with mycorrhizal fungi through its roots.